Thank you so much for all your thoughtful comments on my previous post. It's not the type of topic that I like to cover every day but it is a real part of creative life. Learning more and talking about copyright issues is better than hiding from it all. Don't you think? I had a semi-craft fail last night. I have an idea for a stationery box that I want to make for myself and it didn't quite work. I'm not giving up though, so starting prototype number 2 will be my next step. It's a recycling project, so I'll share when I have it all figured out. 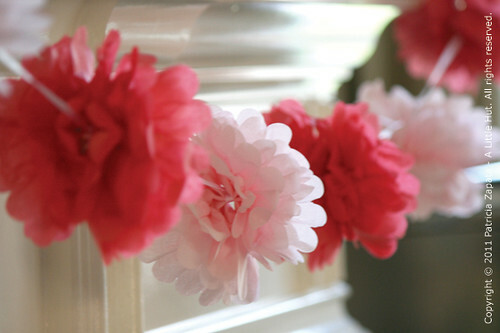 In the meantime, we had some quick paper satisfaction putting together the Martha Stewart pom pom garland—part of the new party goods that I got in the mail for review. Little C has totally laid claim to it—ha! They are now being sold at Joann's Fabric and Craft Stores. Click here for a coupon that is valid until June 30th. The sets are really festive looking and they would be suitable for any type of event. Everything that you could possibly need is included in each set. I also noticed that the quality of paper and printing is quite good. I can see myself using some of these when I'm short on time. In a matter of minutes it would be easy to dress up any gathering. Here are two more items that I got in my intro package: Cello Bag and Basket & Compartment Boxes (photos from Joann's).